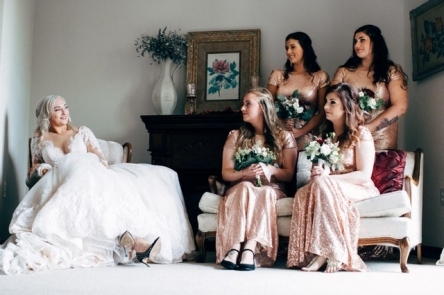 Your bridesmaids are more than your wedding attendants. The shoulders you’ve been crying on every time something went South with the wedding planning. Of course, you want your bridesmaids to look fantastic on the Big Day – but what are some of the most popular color choices for them according to 2019 bridesmaids’ dresses trends? We’ve gathered some tips for you – keep reading and find out more. Blue. How about turning your entire wedding color scheme (and implicitly, your bridesmaids’ looks) into your Something Blue? Wouldn’t that look great? Blue is the kind of color that ads liveliness and vibrancy to a wedding and the best thing about it is that it works very well in a generous number of combinations. Pick a navy blue for a summer wedding and your bridesmaids will love it! Pink. We couldn’t have missed this from the list – pink is, in the end, one of the single most popular wedding colors ever. This year, pink bridesmaids’ dresses are all about the barely there shades, the dusty shades, and the ultra-feminine shades – which means that even bridesmaids who are not particularly in love with pink will actually love wearing these dresses. Green. If you want to add life and energy to your wedding, settle on a green color scheme (you can even create your entire décor out of greenery only!). Choose green dresses for your bridesmaids, and mismatch them in different shades: from the darker, jewel-toned ones to the lighter, mint-shaded ones. Everyone will love the look! Glitter. OK, this is not a color in itself – but it is a pretty huge trend for bridesmaids’ dresses. If you want to help your bridesmaids look glamorous and pretty, pick dresses that have a t least a bit of glitter on them. It doesn’t have to be all sparkle – a touch of it here and there will do the trick, and it will even work with a rustic chic wedding (in fact, it will look amazing). Have you booked your Sevierville wedding venue yet? If you are still searching for the perfect one, be sure to contact Bluff Mountain Inn and come visit us. The lovely landscapes surrounding us and the charming interiors will steal your heart away – and you will never regret choosing us!